Indian ancient Hindu texts repeatedly refer to pearls and provide evidences that India was one place that the god Krishna discovered the first pearl. India is vested with long and glorious history of appreciating pearls. About 3,000 years ago in India pearls were mentioned in the Rig-Veda which is the oldest of the Vedas. Since 2,500 years ago, the Atharveda mentions an amulet made of pearls and used as a talisman in India. The Indian ancient epic poem, the Ramayana, describes a necklace made with 27 pearls. The god Krishna is also associated with pearls in important stories. India may soon become a significant player in the business of pearl culture, if the current venture of Central Institute of Freshwater Acquaculture (CIFA) would work out. Deviating from the traditional round and oval shapes, the CIFI plans to grow pearls would look like Lord Ganesh and Lord Shiva. The experiment involves a radical process, the pearl operation surgery which would be conducted on fresh water mussels. Out of the 50 species of mussels, only 3 are used in the new process. Today the country spends billions each year, importing pearls from China and Japan. But it is possible to produce very good quality pearls from inland resources itself the analysts in CIFA. Due to the huge organic residue easily available by-product of poultry farming, animal husbandry and sewage waste, integrated aquaculture farming may turn out a big source for income for poor farmers for the pearl fishing. Ask any Indian about best pearl shops and she/he invariably tells that the Pearl city of India which comes in mind is Hyderabad the capital of Andhra Pradesh and one of the major cities in the country for pearl industry, inspite of the fact that Hyderabad is neither a coastal area or for that matter near a coastal area. It has the world class pearls' availability which dates back to 400 years of rich culture of Hyderabad history with an amalgamation of arts and crafts. The royal kings of Nizam in Hyderabad lead a rich life inviting craftsman from all over the world especially from the Middle East, where there are rare pearls in abundance. Patar Gatti and Lad bazaar in Charminar are the oldest commercial areas in the twin cities where pearls can be found. Some pearls stores present here are more than a century old. These shops market mainly stones like garnets, topaz, jade and corals. Areas such as Abids and Basheerbagh are flooded with many pearl shops. Some of the shops such as Suraj Bhan Jewellers, Basheerbagh, Jagadamba Pearls (Basheerbagh and Secunderabad), and Mangatrai Pearls have exclusive sections for pearls. Secunderabad too has its share of pearl shops. Pearls have been seen in history and historical legend since Cleopatra's time, when she supposedly dissolved a large pearl in vinegar and drank the potion to demonstrate her infinite wealth. In Roman times Pearls have been found in the graves of women. The largest known pearl weighs about 454 carats and is roughly the size of a chicken egg. The Indian pearl is named as "La Peregrina," a particularly beautiful specimen in shape and lustre, weighs 28 carats, belonged, to Mary Tudor for a time, and was housed in a museum in Moscow, Russia, until the 1960's when it was sold to the actor Richard Burton who presented it as a gift to his wife at the time, Elizabeth Taylor. In 1886, a remarkable natural creation named the "Great Southern Cross" was discovered in an Australian oyster; nine pearls had united during natural pearl formation to produce a perfect cross over 1 in (2.54 cm) long. Pearls are meant for purity and perfection. White pearls symbolize elegance, beauty and peace. They are recognized as Moon and are valued next to diamond. Pearls are born from the molluscs. They are formed in a wide range of colors. Molluscs have a soft body and a hard shell. All molluscs cannot produce pearls, they are still rare. The technique of cultured pearls has made this gem more common. 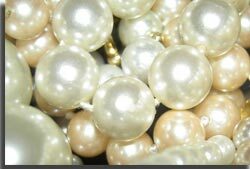 Pearls are usually made of aragonite and conchiolin. Pearls are of different shapes and sizes. These pearls generally depend on the species of mollusc and the time it took to form. They need not necessarily be white but range from, golden, purple to pink and cream. Even black pearl can be found amongst the cultured ones. The common feature remains its glow and lustre due to reflection of light.In Coastal India, Pearls remain in abundance. Pearl Jewellery like necklaces, earrings, rings and bracelets were made with such intricacy that they even resembled laces. Indian pearls and pearl ornaments were exported to Europe during the 17th and the 18th century. They have never lost their importance and popularity since then and have remained in fashion. India was operating pearl fisheries also in the past. 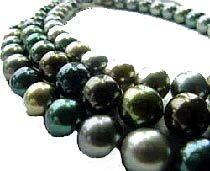 The traditional areas which had produced natural pearls are located in the Gulf of Mannar (Tamil Nadu) and Gulf of Kutch (Gujarat) but today the production is limited. The Central Marine Fisheries Research Institute of the Government of India succeeded in culturing pearls and a project was launched at the Vizhinjam centre, near Thirvananthapuram (Kerala). Efforts were made in Gujarat to produce pearls. With successful experiments in 1994, Rajasthan also hoped to produce cultured pearls from its Southern lakes. However, most of the cultured pearls that India requires have to be imported from Japan and China. Dependence on imports sometimes results in delays and higher costs. Production is also dwindling in Japan. India's latest efforts are to import quality pearls from Myanmar (Burma). Oriental pearls have been coming from old inland collections. These Indian colored gems, pearls and precious jewellery industries employ more than two lakh persons. Besides these workers, traditional gold and silversmiths have spread all over the country in large numbers. The modern jewellery thrust is also pushing up their number. The Indian workforce includes artisans of both male and female. In Jaipur, in some cases, even entire families are engaged in gems processing. The cultured pearl has a future that is both iridescent, like the pearl itself, and murky. The pearl shows every promise of continuing value as an ornament and for jewellery. Like other gems and jewellery, it tends to go in and out of fashion. The future of the cultured pearl is compromised by environmental concerns. Pearl-bearing animals tolerate limited range of ocean or fresh-water environments, and these have diminished with pollution. Commercial oyster beds are jeopardized by polluted water which are decreasing the sizes of pearls produced, discoloration, and less translucent appearance. Mumbai has became attached to the pearling industry because many of the Gulf pearl merchants travelled to the city to seek loans for the expansion of their pearl diving operations and to market their products. Some of them settled down in the city after investing their revenues from pearl trade into real estate projects and other commercial fields. Recently, the Baroda Pearl Carpet was auctioned off in Doha. Containing more than 2.2 million "Basra" pearls (natural pearls harvested in Basra, Iraq), the carpet was commissioned for the tomb of the Prophet Mohammad in Medina, Saudi Arabia. The Gemological Institute of America (GIA) announced that GIA, is planning to offer a pearl grading lab class and a retail jewellery management (RJM) business course which is now taking registrations in India.